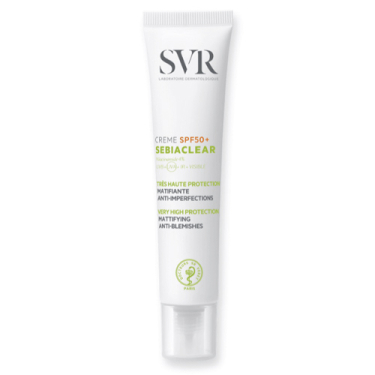 DESCRIPTION: Sebiaclear Crème SPF50 from SVR is a very high sun protection care for combined to oily skin with imperfections. 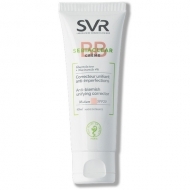 Anti acne, moisturizes and matifies throughout the day. 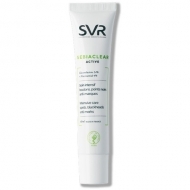 As there are different types of acne prone skin, the SVR laboratory innovates with a unique combination of active ingredients, effective in all these covers: at the heart of the new Sebiaclear formulas, a powerful double active ingredients anti imperfections: Gluconalactone, for an anti-acne action imperfections and a powerful keratolytic power, and Niacinamide for antibacterial effectiveness. Doseed in optimum concentrations, they act on all types of acne prone skin, respecting the skin. Before sun exposure, apply evenly on face.